Secretary of State Tre Hargett is urging Tennesseans to use #GoVoteTN on social media as a way to encourage others to register to vote. During the month of September, which is National Voter Registration Month, people should have someone take a picture of them holding an "I'm registered to vote. Are you?" sign, then post it using the hashtag #GoVoteTN. A flurry of posts is expected on Tuesday, September 27 to celebrate National Voter Registration Day. #GoVoteTN is consistently one of the most successful state-led voter registration social media campaigns in the country. “Tennesseans will be heading to the polls to vote for the next president of the United States before we know it. It’s crucial that people understand the need to get registered now so there won’t be any surprises in November,” Secretary Hargett said. Voters must be registered at least 30 days before an election to cast a ballot. Tuesday, October 11 is the registration deadline to vote in the November 8 general election. Anyone can print their own "I'm registered to vote. Are you?" sign at GoVoteTN.com, which can be customized to the colors of many of the state's colleges, universities or professional sports teams. 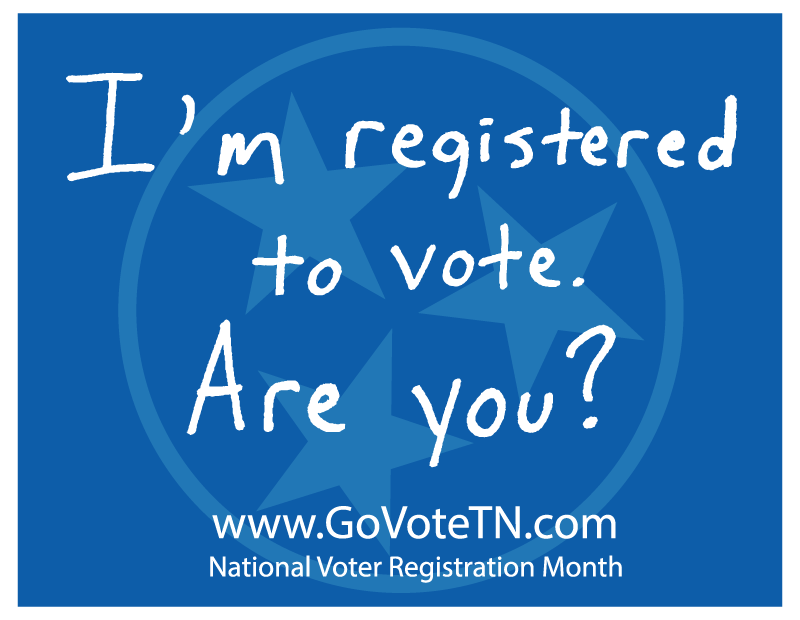 People can also check their registration status, access a voter registration form or download the free GoVoteTN app to access voter specific information, including polling locations, sample ballots and election results. We will share posts on Twitter, Instagram and Facebook to highlight who is proud to be registered to vote, including many well-known Tennesseans. Snap a photo, use #GoVoteTN and post. It's that easy to show the world Tennesseans care about their right to vote.